Painting over laminate can be done, with a special primer. Laminate may look like wood, but it's plastic - you can't stain it and the surface is too difficult for acrylic house paints. But shellac will enable you to paint over your laminate. Shellac is a great material. It dries extremely fast, it's extremely tough and sticks to virtually anything - also to laminate. 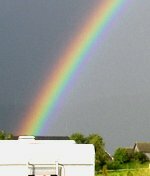 Shellac material itself is non-toxic, but it can only be solved in alcohol, and cleaning has to be done with alcohol(better use disposable rollers). While you work, the fumes (VOC) can be strong, but once dry, it's considered safe for children's toys. Shellac is available as transparent sealer or as hiding primer. It can not be painted over directly with acrylics or polyurethane. But if you paint it with latex, you can put a clear polyurethane layer over that, and give the paint coat some strength. It's best to take a latex primer as an inbetween-layer. The links below are product links, click on them if you want to order them. 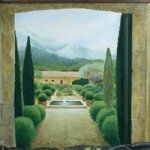 If you'll paint medium to dark colors, a dark or colored background is best. If you want to keep the color of the laminate, use a clear shellac sealer (zinsser BIN clear), and over that a colored vinyl-acrylic primer or acrylic latex paint. The primer will have a better hide. If it doesn't hide in one coat, let it dry and do another coat of colored primer. Sealing is done with the polyurethane laquer. For a painting light colors over a darker piece: prime with white shellac primer. (Zinsser-BIN), then the color of your choice (colored primer), and after that a clear polyurethane. Shellac can be painted over with latex (or oil based) paint - not with acrylics. 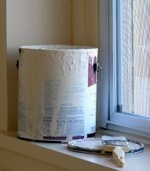 You can take the cheap quality vinyl-latex drywall primer for that. After that, you make the paint strong by an extra coat of tough clear finishing laquer (polyurethane). Shellac dries to the touch within a quarter of an hour. 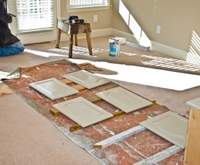 The drying speed can cause some problems if you have to do big surfaces. Prepare your job well. If you work in patches from left to right, make sure the left part isn't already dry before you get back to it to start the next section. Have some denatured alcohol at hand to keep the edges of the previous patch wet. You can also prevent drying by getting back to that section in time (in between, if you have to). Also have several paint rollers at hand - cleaning them can be a nasty job. Maybe it's better (even for the environment) to just dispose of them. 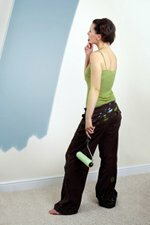 Are you painting furniture? Take it apart if you can, or remove drawers and doors. Do some good abrasing with fine-grained and sharp sanding paper. Open all the windows - shellac is extremely high on VOC during the job. Before opening the window: clean away dust, then it won't be blown into your paintjob. 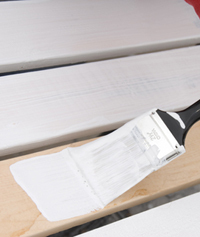 Use disposable paint rollers for quick working (shellac dries extremely fast). Better do a few thin layers, then one layer that's too thick (causing bad paint layers). Work fast: shellac dries through and through within an hour. Scroll up and study the smart layering systems for painting over laminate. Laminate is a difficult surface, and succes depends very much on preparations. 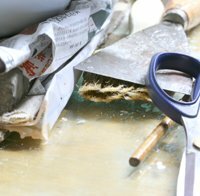 Before you start sanding, it's best to clean your piece with diluted ammonia, then your sandpaper (or abrasive pad) will last much longer. Sanding is all about: making the shine go away. No need to apply force - just go over the surface untill the shine is gone. After that, clean the piece (water and ammonia) - ammonia not only removes fat, but also neutralizes electromagnetic tension, that causes paint layers to repell each other. Dry the piece with a clean cloth, to remove the ammonia, and maybe use the vacuum-cleaner as well. 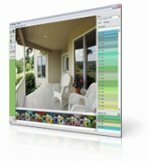 When you paint you need to open the windows, and dust-particles will start to fly around. It would be a pity if they got on your wet piece. 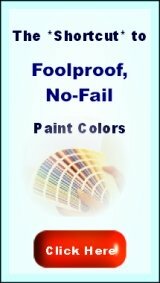 Marine paint (paint for boats) is also said to have good results. Old-fashioned boat laquer is known to be the toughest, glossiest and stickiest laquer around. However, also in the boating trade oil-based paints have been banned, and the replacements are probably good for boats, but not really for laminate. The best thing to get a grip on laminate is shellac. After the shellac, you can apply a latex paint, or an (organic) oil based paint. And after that, a polyurethane laquer for strength. When you use shellac for painting over laminate, it's best to paint it with paint rollers - they work fast, and won't leave hairs in your work. You may not want to try and clean them though... Just take an economy pick, and dispose of them when you're done. If you only want to make your laminate piece darker, changing the faux wood look and keep the wood grain, think of transparent shellac (zinsser bull's eye, or zinsser clear bin sealer). You can add some color to it - use universal colorant for that. BIN sealer is a great product too for blocking stains and odors. On top of that, it's non-toxic (that is: once the paint is dry). Give your piece extremely thin layers with a roller. Eventually, thin the paint with a little alcohol (no ammonia). Then you're sure to get the most natural results. Staining laminate is not possible, because the paint won't go into the material. You can only paint it over with transparant layers, that have to be applied really careful. Even though laminate furniture is cheap: painting it over is still cheaper than replacing it. When your laminate furniture piece has a good model, you can adjust its look to just the way you want it. While you're at it, you might do some faux painting or decorations as well. When using latex paint on the shellac base, you can work relatively fast. When you're done, you can protect your piece with a polyurethane laquer. 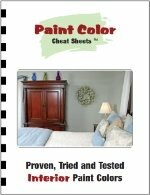 Look here on faux painting furniture for some faux painting ideas.